The latest iterations of golf balls from the major manufacturers are now available – they should improve your game. Recent consumer surveys conducted by the major golf ball manufacturers say other than performance, brand name is the most powerful influence on a golf-ball purchase. Below are the four most recognizable brands and their new models. I am continually asked two questions; are the most expensive golf balls really that much better than less expensive versions, and how do I get fitted for the correct ball?? As for the first question, the short answer is unequivocally yes. Premium multilayer balls with urethanecovers, generally, are superior,because they perform well throughout the bag. On wedge shots, for example, they spin more because of the soft urethane cover, and off the tee they have the same distance-producing characteristics as firmer Surlyn balls. Bottom line is that for the average-golfer’s swing speed, the difference was practically negligible, perhaps five yards further. The real advantage of using urethane-cover balls is the extra spin, feel and control they offer on shots near the green. If you have a decent short game, these balls might be worth the extra money. If you don’t, stick with the lower-priced balls and use the savings to pay your bets. On getting fitted for the right golf ball, going to a clubfitter who uses a Trackman is the preferred option, but, in my opinion, you should test a variety of balls, especially for short game play. Decide which type of shot matters to you most and choose the ball that performs the best on that shot. You also have the option of using golf ball selector tools such as those offered by Bridgestone (www.bridgestonegolf.com/en-us/find-my-ball/ball-selector-tool#/ ), Callaway (www.callawaygolf.com/golf-ball-selector/ ) and Tilesist (www.titleist.com/fitting/golf-ball-fitting) for instance. Bridgestone’s new e12 balls – just what you have been waiting for! Think forgiveness, better distance, straighter flight and smiles. All of these elements are available from Bridgestone’s new e12 balls aptly named SOFT and SPEED. The new e12s replace Bridgestone’s highly successful e6 balls first brought to market almost ten years ago. With over 12 years of ball-fitting data and more than 2.5 million average-golfer swings, Bridgestone’s research and developmental prowess allows Bridgestone to “talk the talk and walk the walk” as evidenced by Tour usage – Tiger, Freddie, Bryson and “Kooch”. The e12 series allows golfers to achieve added ball speed while maintaining the soft compression core of the ball. Bridgestone refers to their “Active Acceleration Mantle” to achieve the aforementioned speed and softness. Bridgestone’s proprietary new Active Acceleration Mantle layer is a key component of the 3-piece construction. The Active Acceleration Mantle is comprised of a new High Performance Polymer material that provides increased thrust and higher initial velocity at impact, while allowing Bridgestone to soften the core for greater forgiveness and enhanced feel. In the past the core was relied upon to produce velocity. This new “mantle” technology now allows for both feel and velocity where the difference lies in the layer between the softer rubber core and the cover. And the new compound provides a more cohesive bond to deliver more energy at impact. Aiming specifically for the Distance Performance golf ball category, their new e12s hit the mark spot on. The e12 series is available in two offerings, the e12 SOFT is for golfers who swing under 105mph, while the e12 SPEED is optimized for faster swings over 105mph. Both models utilize Bridgestone’s Delta Wing Dimple pattern for less drag and optimized aerodynamics in the cover. The two new 3-piece balls will feature different compressions with the e12 Soft at around a 50 overall compression and the e12 Speed around 75. Both balls are designed to reduce sidespin for straighter tee shots. The eSOFT is available in White, Matte Green, Matte Red and Matte Yellow. The e12 SPEED is available in white. Don’t forget that you can also use Bridgestone’s Ball Selector tool to verify which Bridgestone ball works best for you. Good golfers like this ball. 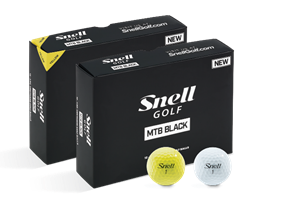 Great players, including Tour players, are enthralled with Snell Golf’s My Tour MTB ball. An up and coming ball manufacturer, who has years of experience and is delivering probably one of the best golf balls on the market. Many Tour pros have tested this ball and many feel it is equal to, if not better, than any golf ball currently available. But due to their contractual obligations, cannot play the balls in competition, but do so when not competing. Over the last few years, Snell Golf has been disrupting the golf ball market. With its direct-to-consumer e-commerce strategy, the brand has made in-roads into supplying top end golf balls at a fraction of the price to the everyday golfer. The company focuses on the common golfer and does not pay tour contracts to professionals, preferring to pass the savings on to golfers who actually pay for their golf balls. But this isn’t just any e-commerce start up. Its founder, Dean Snell, holder of 38 golf patents, is a highly respected golf ball expert with over 25 years in research and development roles for companies, such as Titleist and Taylormade, and is the inventor or co-inventor of the Pro V1, Professional, Penta and Tour Preferred balls. Following their enormous success and popularity, Dean Snell, the golf ball wizard, paid attention to his customer’s feedback and is now introducing the MTB-X model that will provide high spin for approach shots, while lowering driver spin and maximizing distance off the tee. The new MTB-X model also has added the elite feel and durability of a cast urethane cover. The MTB-X model replaces Snell’s MTB RED model (2018) and offers players an easy to differentiate pair: MTB BLACK for players looking for soft feel and medium iron spin, and the new MTB-X for a firmer feel and higher iron spin. Both models offer low driver spin, exceptional distance, and high performance around the green. These models will also be offered in a one dozen “MTB Test Pack”, featuring two sleeves of each MTB model and a fitting guide to help players choose which model works best for their game. 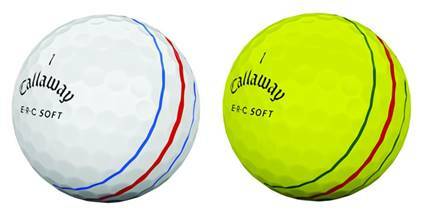 All 2019 MTB golf ball models will be offered in white and optic yellow. Pricing for the MTB models will start at $32.99 for ONE DOZEN and offer a new, volume based pricing structure reducing costs to $27.99/dz for a 5 dozen value pack. All orders include FREE SHIPPING. In addition, orders of 5 dozen or less will be delivered with FREE 2-day shipping, rather than standard ground delivery. The leading manufacturer of golf balls worldwide and the preferred ball for most Tour players on all Tours is Titleist. Titleist’s name is synonymous with quality and the premier golf ball for every category offered in the market place. For 2019, Titleist’s R&D team, through their prototyping process, and their chemists and engineers, discovered a way to cast an even thinner urethane cover, and, therefore, increased the percentage of speed-enhancing materials in the overall construction. The Pro V1 and Pro V1x are now even faster, as a result, all while maintaining the scoring performance and feel characteristics that golfers demand from these golf balls. When it comes to choosing between the total performance of Pro V1 and Pro V1x, golfers will notice similar attributes in flight, feel, and spin, as the prior generation models. Both Pro V1 and Pro V1x deliver increased ball speed and lower long game spin for maximum distance, consistent flight, Drop-and-Stop™ short game control, and long-lasting durability. Pro V1 provides optimal flight and spin for most golfers, flying lower than Pro V1x with a penetrating trajectory with a very soft feel. Pro V1x flies higher, spins more on iron shots, and has a slightly firmer feel. PRO V1 TECHNOLOGY: The 2019 Pro V1 is a three-piece, multi-component technology with a thinner cast Urethane Elastomer cover system, faster ionomeric casing layer, new 2.0 ZG Process Core and spherically-tiled 352 tetrahedral dimple design. PRO V1x TECHNOLOGY: The 2019 Pro V1x is a four-piece, multi-component technology with a thinner cast Urethane Elastomer cover system, faster ionomeric casing layer, new 2.0 ZG process dual core and spherically-tiled 328 tetrahedral dimple design. To date, using the new Pro V1 and Pro V1x balls, players have combined for six victories across five tours since the tour seeding and validation process began, including a comeback victory by Cameron Smith (Pro V1x) at the Australian PGA Championship. Additionally, Patton Kizzire (Pro V1x) and Brian Harman (Pro V1) teamed up to win the two-man QBE Shootout, playing 2019 models for the first time. 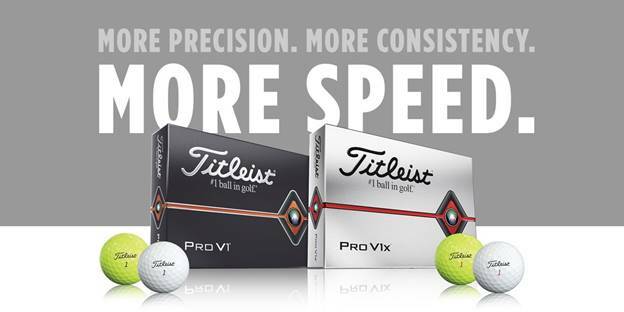 More than 200 players worldwide have put new Pro V1 and Pro V1x in play. Bubba Watson and Rory Sabbatini are playing the new yellow version. The new 2019 Pro V1 and Pro V1x golf balls are now available in golf shops, with the high optic yellow models available March 15th. Named after Callaway’s founder, Ely Reeves Callaway, Callaway’s engineers designed their largest ever Graphene-infused Dual SoftFast Core. The ERC Soft is being sold as a distance-enhancing ball and aimed at players looking to find more length off the tee and with their iron shots. 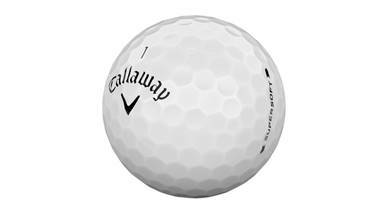 The ERC has a similar structure to the popular Callaway Chrome ball. The new Hybrid Cover of the 3-piece ERC Soft is a soft multi-material cover that promotes fast ball speeds for long distance through the bag, increased feel, and higher spin for control into the green. Callaway has added “Triple Track” lines on the ball for improved putting alignment and accuracy which should appeal to many golfers who struggle with alignment on the greens. The Triple Track pattern is based on Vernier Visual Acuity, which basically means that it is proven to be the best visual alignment pattern compared to a regular side stamp alignment aid. Supposedly, the three lines, a thick red line in the center supported by two thinner blue lines either side, which only go halfway around the ball, help your brain align the ball better than a single line. This is definitely more for use with a putter than a driver. The ERC soft is available in yellow and white cover options. The Supersoft Magna provides all of the benefits of the Supersoft, but in a larger size. Yes, it is an oversized golf ball that raises the center of gravity slightly, allowing for a higher launch and easier contact. It will help players to make better contact on the club face to promote more consistent shots with high launch. This ball should help build their confidence when standing over the ball, due to its size.The newly designed HEX Aerodynamics for this oversized ball are optimized to promote a lower spin rate, to reduce drag, and enhance lift for increased carry, higher flight, and longer distance. The Magna conforms to the USGA Rules of Golf, and it’s designed for players who struggle with consistent solid contact, and those looking for more distance and easy launch, such as juniors, developing golfers, and slow swing speed players. The Supersoft’s low compression core promotes faster ball speed and low spin for longer, straighter flight on full shots. Enhanced feel and increased greenside control come from a soft Trionomer cover for shot-stopping wedge spin and great feel. Will better players become converts? I doubt this will be the case. Available in white, pink and yellow. The choices are numerous, so try them out and find the ball that suits your game and pocketbook. In addition, Dr.Lotz works with 14 PGA Tour players on their mental and putting games. He also writes for numerous golf magazines ( LA Times -Golf Living, Golf Tips Magazine, Golf Champion Magazine, Inside Golf Canada, British Columbia Golf, to name a few) and specializes specifically in golf equipment (putter addict) and golf travel. 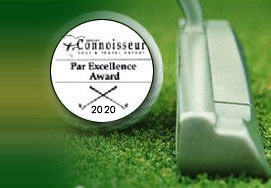 This entry was posted on Monday, February 25th, 2019 at 10:50 pm and is filed under Golf Equipment Reviews. You can follow any responses to this entry through the RSS 2.0 feed. Both comments and pings are currently closed. Barry Lotz, J.D., Ph.D. is the director of the Professional Golf Teachers Association of America. He is a member of the Golf Writers Association of America, the California Golf Writers Association, and serves both as a Consultant and Mediator to the golf industry. He is also the author of numerous books, including "333 Best Web Sites for Golfers" and his current book, "How to Build Business Relationships Through Golf" is in the Top Ten Golf Business Book's best seller list. Copyright © 2003 - 2018. 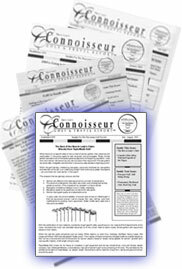 Connoisseur Golf & Travel Report. All Rights Reserved.